A sliced chambered nautilus was printed on the front cover of my eighth-grade math textbook. Hidden by the required book cover – I drew the beautiful spiraling shell on mine. Within its pages, I would learn about Fibonacci numbers, a sequence in which the third number is the sum of the two preceding numbers. It is expressed in this series of numbers: 0, 1, 1, 2, 3, 5, 8, 13, 21, 34, 55, 89, 144, into infinity. Much of nature follows this pattern. It is the familiar spiral easily recognized in nature. Ancient mathematicians, architects, and philosophers understood this pattern was the golden ratio. From the double helix of DNA to the expanding universe, it is the pervasive pattern of life. Known centuries earlier to ancient Egyptians and Indian mathematicians, the Fibonacci sequence was introduced to the Western world in 1202 by Italian mathematician Leonardo Pisano, in his book Liber Abaci. The pattern created by the spiraling out of the Fibonacci numbers – the golden spiral – can be seen throughout nature. It is seen in the growth pattern of coral, the graceful uncurling of a fern, the silken web of a spider, the dimensions of a sand dollar, and of course – in the spiral of a shell, particularly the chambered nautilus. The shape of the nautilus and other spiraling shells has been the muse of many architects. Spiral staircases in lighthouses and the beautiful patterns in Gothic cathedrals inspired by nature follow the sequence. Inspired by the Japanese Wonder Shell, Frank Lloyd Wright designed New York’s Guggenheim Museum. Why does nature follow the pattern of this sequence? According to Dan Reich, at Temple University, Department of Mathematics, the spirals arise from a property of growth termed self-similarity – the tendency to increase in size but maintain the same overall shape. In the simplest terms, nature favors this sequence because it works. It is the framework of nature; the most efficient way to grow strong stable structures, using as little energy as possible. Just as it was used on the cover of my textbook, the chambered nautilus is widely associated with the golden ratio and golden spiral. Technically the nautilus shell shows a logarithmic spiral. Because it does not appear to follow the sequence exactly, this use of the nautilus is viewed by some as controversial. Recent theory suggests there may be more than one way to create a golden spiral, relating the nautilus to a slightly different variation of the classic spiral. Those who argue against it might be missing something. 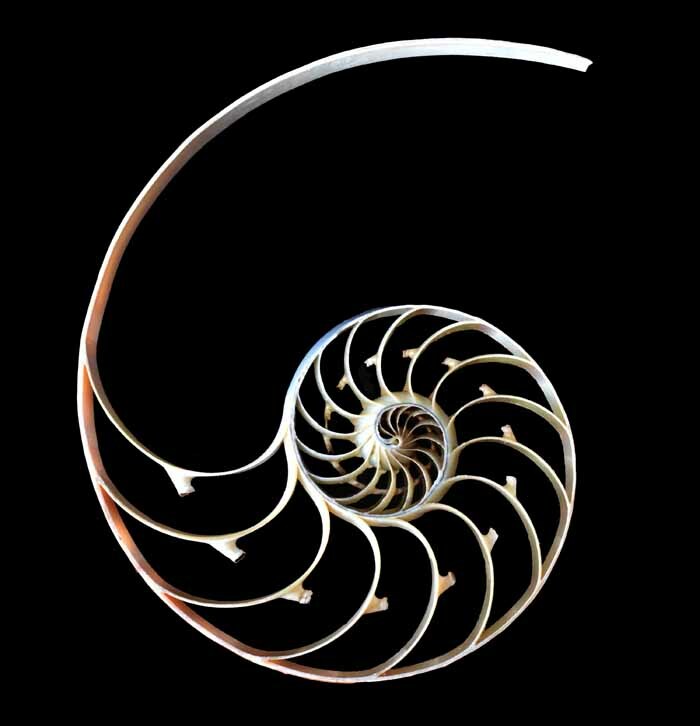 In the nautilus’ case, the golden spiral is more about function than form. The chambered nautilus controls its buoyancy by siphoning water through its chambers or camerae and adjusting the volume and density of water. Occupying the largest camerae of its shell, as it matures the nautilus creates and moves into increasingly larger chambers – one chamber at a time. Spiraling outward as the shell increases in size each new larger chamber maintains the same shape. In this image, the animal occupies the last sealed chamber.